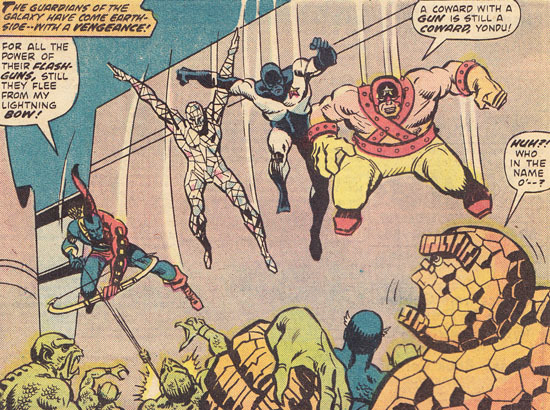 The original Guardians of the Galaxy first appeared in Marvel Super-Heroes #18, and were completely unlike their current day/movie counterparts. Set in the 31st century, the Guardians are the last of their respective races: consisting of Earthman Vance Astro (an alternate version of New Warrior/Avenger Justice), Martinex T’Naga (a denizen of Pluto), Captain Charlie-27 (soldier from Jupiter), Yondu Udonta from Alpha Centauri and “The One Who Knows” Starhawk, the team fights against the alien warrior race the Badoon. The Guardians also would go on to travel to the past and team with the Avengers to fight Michael Korvac in the Korvac Saga. You can check out the two volumes available here and here. The team would also return for a run in the 1990’s, helmed by Jim Valentino, and featuring an expanded cast. The series lasted 62 issues, and both runs of Guardians are collected, but the Guardians franchises remained dormant until writers Dan Abnett and Andy Lanning changed the Marvel Cosmic Arena. Jim Valentino’s run is collected here and here. In 2006, Dan Abnett and Andy Lanning created one of the most universe shattering events in Marvel’s history. Annihilus, lord of the Negative Zone, is tired of seeing the Positive Universe (the Marvel Universe) expand into his territory. He sends his entire swarm, the Annihilation Wave, into the universe to “reclaim” the territories. This results in a number of events: the destruction of the Nova Corps, a pan galactic alliance between the Shi’ar, Kree, Skrulls and other galactic powers, and the launching of one of the best space epics since Star Wars. Annhilation also launched an ongoing Nova series, featuring Richard Ryder as Nova Prime, keeper of the Nova Force. 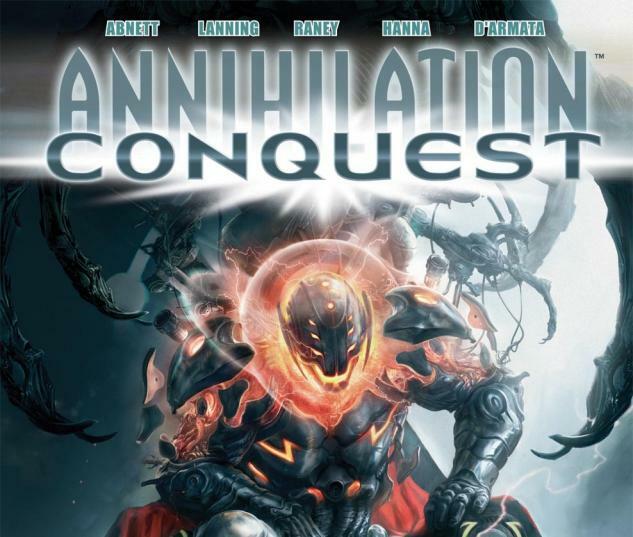 Annihilation also spawned a sequel, Annihilation: Conquest. It’s in Conquest that we see a second threat to the universe, a re-formed Phalanx. The Phalanx are a techno-organic race that absorbs other sentient beings into itself. The Phalanx itself is under the control of another megalomaniacal villain: Ultron. Old alliances are re-forged, and the results of this massive war is the formation of a proactive group, led by Peter Quill, the Guardians of the Galaxy. There is an Omnibus edition that collects both events. Star-Lord’s Guardians consisted of a few choice cosmic characters: Adam Warlock (an artificial being who has achieved cosmic awareness, whose powers and abilities change with each evolution, in this version, he controlled “quantum magic”), Gamora (daughter of Thanos, master assassin, deadliest woman in the universe), Drax the Destroyer (A man whose family was murdered by Thanos, resurrected to seek vengeance against the Mad Titan), Quasar (Phyla-Vell, daughter of Captain Mar-Vell), Rocket Raccoon (a gifted tactician who likes big guns, also a talking raccoon), Groot (a sentient tree from Planet X) and Mantis (the Celestial Madonna, savior of the Kree, telepathic grandmistress of numerous martial arts). The Guardians decide to make their homebase in Knowhere, the head of a dead Celestial, where they have a working agreement with the station’s security chief, Cosmo (a telepathic Russian dog). The Guardians face a variety of galactic threats, and the team’s roster is in constant flux. The series ended with the Thanos Imperative event, where Peter Quill and Nova seemingly give their lives to stop Thanos from leaving the Cancerverse, a universe with no death. The first Ultimate Collection was recently released, collecting the first 12 issues. The Guardians made their return in the Avengers Assemble comic, along with the Mad Titan Thanos. The Guardians of the Galaxy this time consisted of Star-Lord, Groot, Rocket, Gamora, and Drax. The Guardians this time were directly aligned against Peter’s father, King J’Son of Spartax. J’Son and his son have been at odds for years, and the Earth becomes another object that the two fight over. The current incarnation of Guardians is written by Marvel’s veteran writer Brian Michael Bendis, and has featured prominently in events like Infinity, and has had a crossover with Bendis’ All-New X-Men. Volumes 1 and Volume 2 of Bendis’ work are currently available. With the movie coming out, the team is ready to take on a much larger profile. I’ve been a fan of Guardians since their reintroduction in 2008, I’m both surprised and elated that Marvel has decided to push the team deeper into the spotlight. Midtown has a pretty good selection, check out the website and see what’s out!